My thoughts on writer Hope Larson’s Batgirl series goes back and forth a bit, but in general I’m enjoying this series. The first story arc started off on the upper side of ok, but ended brilliantly. The second story arc kind of went the opposite way, but the last issue was still fun. 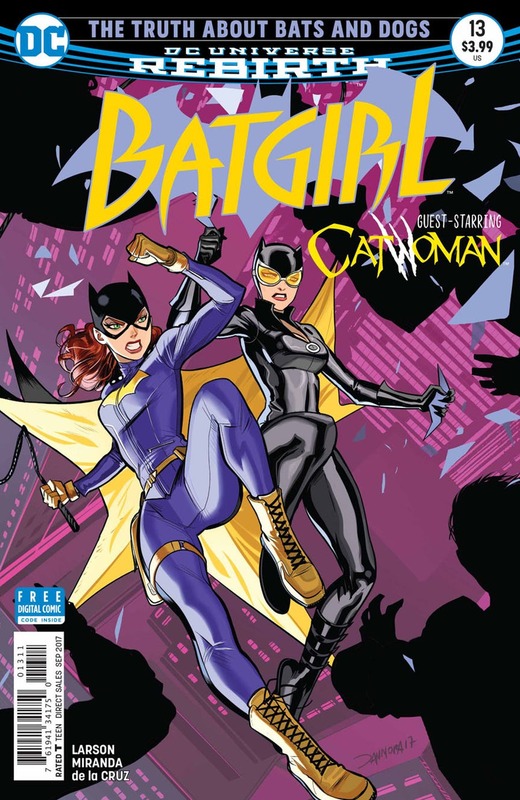 Batgirl 13 is a one-off story that teams Batgirl up with Catwoman. The story is simple and lighthearted enough. Batgirl runs into a 7-year-old kid she teaches as a day job, who is out looking for a missing celebrity dog. The kid happens to be a bit of a prodigy and even helps Barbara out a bit in their search. They run into Catwoman who is looking for a celebrity cat of her own, and they team up. The search leads them to Velvet Tiger’s lair (an animal themed Batgirl villain who debuted in the previous ongoing series). There’s a fight scene, and then everyone goes home. It might not sound all that exciting when I put it that way, but this is a fun comic. The girl seems to love animals, but she’s allergic to them as well. That leads to a couple of amusing moments, and Batgirl’s interactions with her are fun. The banter between Batgirl and Catwoman is limited but enjoyable. I’m really not sure what else to say about this one. It’s lighthearted and fun. The art by Inaki Miranda is great. It’s a combination of a soft, smooth general look and plenty of detail in the backgrounds. The best art moment is probably when the kid tells Batgirl about how the missing dog lives with the fire department after they rescued him from a burning factory. The art is a mix of the two of them walking through the building in full colour, while reddened flashbacks of the firemen searching the ruins and finding the very thankful dog are intermixed with them. Facial expressions add to the comic’s charm, like Catwoman’s grin when the girls’ sneeze betrays her and Batgirl’s location, Batgirl’s cold stare when she scares away a children’s gang, and the girl’s delighted smile when they find the missing dog. Eva De La Cruz’s colouring is also great. There’s brilliant use of lighting and shadows in relation to the girl’s flashlight strapped on her helmet, and there’s plenty of colour variety in the environments. Normally I’d review Detective Comics over a comic like this that’s just a light hearted one-off, but it’s been a while since I’ve reviewed Batgirl. There are times that I miss Gail Simone’s darker toned Batgirl series, but at the same time, it’s nice that there is a more lighthearted entry in the Batman franchise. If this sounds like fun, then you’ll probably enjoy it and it’ll be worth picking up. This entry was posted in comic, comic review and tagged barbara gordon, batgirl, catwoman, comic review, comics, dc comics, dc rebirth, eva de la cruz, hope larson, inaki miranda, seline kyle. Bookmark the permalink.